Ο μόνος αποτελεσματικός τρόπος πρόληψης του κοινού κρυολογήματος είναι προλαμβάνοντας σωματικά τη διάδοση των ιών. Αυτό περιλαμβάνει κυρίως το πλύσιμο των χεριών και τη χρήση ιατρικών μασκών. Σε νοσοκομειακό περιβάλλον ενδείκνυται η χρήση ιατρικής ρόμπας και γαντιών μιας χρήσης. Η απομόνωση των πασχόντων δεν είναι δυνατή, καθώς η νόσος είναι ευρέως διαδεδομένη και τα συμπτώματα μη συγκεκριμένα. Ο εμβολιασμός έχει αποδειχθεί δύσκολος, καθώς ο αριθμός των ιών που σχετίζονται με τη νόσο είναι πολύ μεγάλος και οι ιοί μεταβάλλονται ταχύτατα. Η ανάπτυξη ενός εμβολίου ευρέος φάσματος προστασίας είναι εξαιρετικά απίθανη. Το συχνό πλύσιμο χεριών μειώνει τη μετάδοση των ιών του κρυολογήματος. Αυτή η μέθοδος είναι πολύ πιο αποτελεσματική ιδίως στα παιδιά. Δεν είναι γνωστό εάν η χρήση αντιϊκών ή αντιβακτηριδιακών μέσων κατά το καθημερινό πλύσιμο των χεριών αυξάνει τα πλεονεκτήματά του. Η χρήση ιατρικών μασκών κοντά σε πάσχοντες μπορεί να είναι αποτελεσματική. Δεν υπάρχουν επαρκή στοιχεία που να αποδεικνύουν πως η κοινωνική απόσταση είναι ή όχι ωφέλιμη. Δεν υπάρχουν επαρκή στοιχεία που να αποδεικνύουν ότι η λήψη συμπληρωμάτων ψευδάργυρου έχει αποτελέσματα στη μείωση του αριθμού των κρυολογημάτων που θα κολλήσει κάποιος. Η τακτική λήψη συμπληρωμάτων βιταμίνης C δε μειώνει τον κίνδυνο ή τη δριμύτητα του κοινού κρυολογήματος. Ωστόσο, η βιταμίνη C είναι πιθανό να μειώσει τη διάρκειά του. ↑ 2,0 2,1 2,2 2,3 2,4 Arroll, B (2011 Mar 16). «Common cold.». Clinical evidence 2011 (03). PMID 21406124. ↑ 3,0 3,1 3,2 3,3 3,4 3,5 3,6 3,7 3,8 3,9 Eccles R (November 2005). «Understanding the symptoms of the common cold and influenza». Lancet Infect Dis 5 (11): 718–25. doi:10.1016/S1473-3099(05)70270-X. PMID 16253889. http://ndmat.hosp.ncku.edu.tw:8080/%E5%85%92%E7%A7%91/Feb-27.pdf. ↑ Heikkinen T, Järvinen A (January 2003). «The common cold». Lancet 361 (9351): 51–9. doi:10.1016/S0140-6736(03)12162-9. PMID 12517470. ↑ Goldsobel AB, Chipps BE (March 2010). «Cough in the pediatric population». J. Pediatr. 156 (3): 352–358.e1. doi:10.1016/j.jpeds.2009.12.004. PMID 20176183. ↑ Palmenberg, A. C.; Spiro, D; Kuzmickas, R; Wang, S; Djikeng, A; Rathe, JA; Fraser-Liggett, CM; Liggett, SB (2009). «Sequencing and Analyses of All Known Human Rhinovirus Genomes Reveals Structure and Evolution». Science 324 (5923): 55–9. doi:10.1126/science.1165557. PMID 19213880. ↑ 12,0 12,1 12,2 «Common Cold». National Institute of Allergy and Infectious Diseases. 27 November 2006. Ανακτήθηκε στις 11 June 2007. ↑ 14,0 14,1 14,2 editors, Ronald Eccles, Olaf Weber, (2009). Common cold (Online-Ausg. έκδοση). Basel: Birkhäuser, σελ. 197. ISBN 9783764398941. http://books.google.ca/books?id=rRIdiGE42IEC&pg=PA197. ↑ 16,0 16,1 16,2 16,3 al. ], edited by Arie J. Zuckerman ... [et (2007). Principles and practice of clinical virology (6th ed. έκδοση). Hoboken, N.J.: Wiley, σελ. 496. ISBN 9780470517994. http://books.google.ca/books?id=OgbcUWpUCXsC&pg=PA496. ↑ Gwaltney JM Jr, Halstead SB. «Contagiousness of the common cold». Invited letter in «Questions and answers». Journal of the American Medical Association 278 (3): 256–257. 16 July 1997. http://jama.ama-assn.org/content/278/3/256. Ανακτήθηκε στις 16 September 2011. ↑ Zuger, Abigail (4 March 2003). «'You'll Catch Your Death!' An Old Wives' Tale? Well...». The New York Times. http://query.nytimes.com/gst/fullpage.html?res=9D02E1DD163FF937A35750C0A9659C8B63. ↑ Mourtzoukou, EG; Falagas, ME (2007 Sep). «Exposure to cold and respiratory tract infections.». The international journal of tuberculosis and lung disease : the official journal of the International Union against Tuberculosis and Lung Disease 11 (9): 938–43. PMID 17705968. ↑ Cohen S, Doyle WJ, Alper CM, Janicki-Deverts D, Turner RB (January 2009). «Sleep Habits and Susceptibility to the Common Cold». Arch. Intern. Med. 169 (1): 62–7. doi:10.1001/archinternmed.2008.505. PMID 19139325. ↑ Lawrence DM (May 2009). 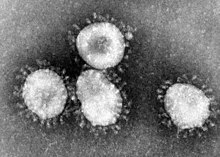 «Gene studies shed light on rhinovirus diversity». Lancet Infect Dis 9 (5): 278. doi:10.1016/S1473-3099(09)70123-9. http://www.thelancet.com/journals/laninf/article/PIIS1473-3099%2809%2970123-9. ↑ 33,0 33,1 33,2 Jefferson, T; Del Mar, CB, Dooley, L, Ferroni, E, Al-Ansary, LA, Bawazeer, GA, van Driel, ML, Nair, S, Jones, MA, Thorning, S, Conly, JM (2011 Jul 6). «Physical interventions to interrupt or reduce the spread of respiratory viruses.». Cochrane database of systematic reviews (Online) (7): CD006207. doi:10.1002/14651858.CD006207.pub4. PMID 21735402. ↑ 34,0 34,1 Singh, M; Das, RR (2011 Feb 16). «Zinc for the common cold.». Cochrane database of systematic reviews (Online) (2): CD001364. doi:10.1002/14651858.CD001364.pub3. PMID 21328251. ↑ 35,0 35,1 Hemilä, Harri; Chalker, Elizabeth; Douglas, Bob; Hemilä, Harri (2007). Hemilä, Harri, επιμ. «Vitamin C for preventing and treating the common cold». Cochrane database of systematic reviews (3): CD000980. doi:10.1002/14651858.CD000980.pub3. PMID 17636648. ↑ «Common Cold: Treatments and Drugs». Mayo Clinic. Ανακτήθηκε στις 9 January 2010. ↑ 37,0 37,1 37,2 37,3 37,4 Simasek M, Blandino DA (2007). «Treatment of the common cold». American Family Physician 75 (4): 515–20. PMID 17323712. http://www.aafp.org/afp/20070215/515.html. ↑ Kim SY, Chang YJ, Cho HM, Hwang YW, Moon YS (2009). Kim, Soo Young, επιμ. «Non-steroidal anti-inflammatory drugs for the common cold». Cochrane Database Syst Rev (3): CD006362. doi:10.1002/14651858.CD006362.pub2. PMID 19588387. ↑ Eccles R (2006). «Efficacy and safety of over-the-counter analgesics in the treatment of common cold and flu». Journal of Clinical Pharmacy and Therapeutics 31 (4): 309–319. doi:10.1111/j.1365-2710.2006.00754.x. PMID 16882099. ↑ Smith SM, Schroeder K, Fahey T (2008). Smith, Susan M, επιμ. «Over-the-counter medications for acute cough in children and adults in ambulatory settings». Cochrane Database Syst Rev (1): CD001831. doi:10.1002/14651858.CD001831.pub3. PMID 18253996. ↑ 42,0 42,1 Shefrin AE, Goldman RD (November 2009). «Use of over-the-counter cough and cold medications in children». Can Fam Physician 55 (11): 1081–3. PMID 19910592. PMC 2776795. http://www.cfp.ca/content/55/11/1081.full. ↑ Vassilev, ZP; Kabadi, S, Villa, R (2010 Mar). «Safety and efficacy of over-the-counter cough and cold medicines for use in children.». Expert opinion on drug safety 9 (2): 233–42. doi:10.1517/14740330903496410. PMID 20001764. ↑ Taverner D, Latte J (2007). Latte, G. Jenny, επιμ. «Nasal decongestants for the common cold». Cochrane Database Syst Rev (1): CD001953. doi:10.1002/14651858.CD001953.pub3. PMID 17253470. ↑ Albalawi, ZH; Othman, SS, Alfaleh, K (2011 Jul 6). «Intranasal ipratropium bromide for the common cold.». Cochrane database of systematic reviews (Online) (7): CD008231. doi:10.1002/14651858.CD008231.pub2. PMID 21735425. ↑ Pratter, MR (2006 Jan). «Cough and the common cold: ACCP evidence-based clinical practice guidelines.». Chest 129 (1 Suppl): 72S-74S. doi:10.1378/chest.129.1_suppl.72S. PMID 16428695. ↑ Guppy, MP; Mickan, SM, Del Mar, CB, Thorning, S, Rack, A (2011 Feb 16). «Advising patients to increase fluid intake for treating acute respiratory infections.». Cochrane database of systematic reviews (Online) (2): CD004419. doi:10.1002/14651858.CD004419.pub3. PMID 21328268. ↑ Singh, M; Singh, M (2011 May 11). «Heated, humidified air for the common cold.». Cochrane database of systematic reviews (Online) (5): CD001728. doi:10.1002/14651858.CD001728.pub4. PMID 21563130. ↑ Paul IM, Beiler JS, King TS, Clapp ER, Vallati J, Berlin CM (December 2010). «Vapor rub, petrolatum, and no treatment for children with nocturnal cough and cold symptoms». Pediatrics 126 (6): 1092–9. doi:10.1542/peds.2010-1601. PMID 21059712. http://pediatrics.aappublications.org/cgi/reprint/peds.2010-1601v1. ↑ 51,0 51,1 Arroll B, Kenealy T (2005). Arroll, Bruce, επιμ. «Antibiotics for the common cold and acute purulent rhinitis». Cochrane Database Syst Rev (3): CD000247. doi:10.1002/14651858.CD000247.pub2. PMID 16034850. ↑ Oduwole, O; Meremikwu, MM, Oyo-Ita, A, Udoh, EE (2010 Jan 20). «Honey for acute cough in children.». Cochrane database of systematic reviews (Online) (1): CD007094. doi:10.1002/14651858.CD007094.pub2. PMID 20091616. ↑ Kassel, JC; King, D, Spurling, GK (2010 Mar 17). «Saline nasal irrigation for acute upper respiratory tract infections.». Cochrane database of systematic reviews (Online) (3): CD006821. doi:10.1002/14651858.CD006821.pub2. PMID 20238351. ↑ Heiner, Kathryn A; Hart, Ann Marie; Martin, Linda Gore; Rubio-Wallace, Sherrie (2009). «Examining the evidence for the use of vitamin C in the prophylaxis and treatment of the common cold». Journal of the American Academy of Nurse Practitioners 21 (5): 295–300. doi:10.1111/j.1745-7599.2009.00409.x. PMID 19432914. ↑ 58,0 58,1 Linde K, Barrett B, Wölkart K, Bauer R, Melchart D (2006). Linde, Klaus, επιμ. «Echinacea for preventing and treating the common cold». Cochrane Database Syst Rev (1): CD000530. doi:10.1002/14651858.CD000530.pub2. PMID 16437427. ↑ Sachin A Shah, Stephen Sander, C Michael White, Mike Rinaldi, Craig I Coleman (2007). «Evaluation of echinacea for the prevention and treatment of the common cold: a meta-analysis». The Lancet Infectious Diseases 7 (7): 473–480. doi:10.1016/S1473-3099(07)70160-3. PMID 17597571. ↑ «Cold». Online Etymology Dictionary. Ανακτήθηκε στις 12 January 2008. ↑ Tyrrell DA (1987). «Interferons and their clinical value». Rev. Infect. Dis. 9 (2): 243–9. doi:10.1093/clinids/9.2.243. PMID 2438740. ↑ Al-Nakib, W; Higgins, PG; Barrow, I; Batstone, G; Tyrrell, DA (December 1987). «Prophylaxis and treatment of rhinovirus colds with zinc gluconate lozenges». J Antimicrob Chemother. 20 (6): 893–901. doi:10.1093/jac/20.6.893. PMID 3440773. ↑ «The Cost of the Common Cold and Influenza». Imperial War Museum: Posters of Conflict. vads. ↑ 70,0 70,1 70,2 Fendrick AM, Monto AS, Nightengale B, Sarnes M (2003). «The economic burden of non-influenza-related viral respiratory tract infection in the United States». Arch. Intern. Med. 163 (4): 487–94. doi:10.1001/archinte.163.4.487. PMID 12588210. http://archinte.ama-assn.org/cgi/content/full/163/4/487. ↑ Kirkpatrick GL (December 1996). «The common cold». Prim. Care 23 (4): 657–75. doi:10.1016/S0095-4543(05)70355-9. PMID 8890137. ↑ «Genetic map of cold virus a step toward cure, scientists say». Val Willingham (CNN). March 2009. http://www.cnn.com/2009/HEALTH/02/12/cold.genome/. Ανακτήθηκε στις 28 April 2009. Ronald Eccles, Olaf Weber (eds) (2009). Common cold (Online-Ausg. έκδοση). Basel: Birkhäuser. ISBN 978-3764398941. http://books.google.ca/books?id=rRIdiGE42IEC. Τελευταία τροποποίηση 12:08, 24 Δεκεμβρίου 2017.